When you think about setting your home apart from others in the neighborhood, think about special shape windows as part of your plan. By incorporating custom windows into your home, you add a new dimension and flair to customizing your windows. Best Buy Windows and Siding has many shapes to choose from to match your unique window design. Our architectural shapes provide aesthetic distinction to any new or existing home. We can also combine or stack special shape windows, providing your home with a distinctive style and beautiful views. We provide clear glass as a standard feature in all of our special shape windows. You can upgrade the glass with options including low-E glass, tinted glass, obscure glass, tempered glass, and argon gas-filled glass units. Though they can last a long time, custom windows can break and will need to be repaired. When your custom windows are in need of repair, trust an expert with the job. At Best Buy Windows and Siding, our professionals care about the look of your home, and we want to make sure that your house is your dream home. Traditional style window. Custom built for a precise fit and optimum energy efficiency. Bottom sash operates. Economically priced, available in the Dallas area only. Low-E glass with argon gas for insulation. Full fusion welds for durability. Beveled exteriors for a trim-line appearance. 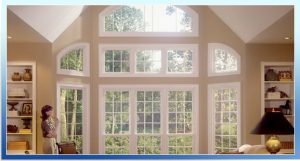 Best Buy Windows and Siding is your first choice in Dallas for special shape window designs and installation. Call us today, and we can meet at your convenience to discuss the different options and answer your questions. The consultation is free, and we’ll be prompt in providing you an exact quote for your window needs. When choosing a custom windows service, Best Buy Windows and Siding can help you create a design to fit your home. Contact us at 214-736-9971.